The perfect accompaniment to a Mediterranean lunch, this Cherry Tomato Focaccia bread is at its best when served with mozzarella, Italian prosciutto and salad. 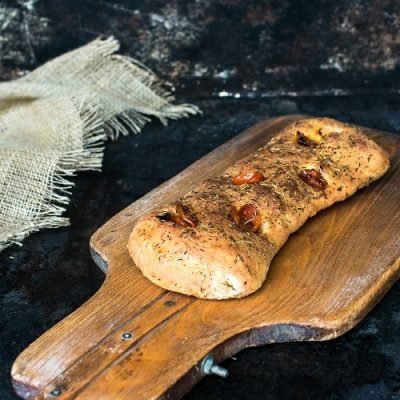 Studded with cherry tomatoes and sprinkled with herbs, this wonderful tasting bread should be served to friends and family on a warm summer day. Fortified Wheat Flour (Wheat Flour, Iron, Niacin, Thiamin, Calcium Carbonate), Water, Dried Cherry Tomatoes (4%) (Sunflower Oil, Oregano, Garlic, Salt, Acidity Regulator: Citric Acid), Extra Virgin Olive Oil, Salt, Yeast, Rock Salt, Rye Flour, Rosemary, Oregano, Acetic Acid, Ascorbic Acid; Roasted Malted Wheat.